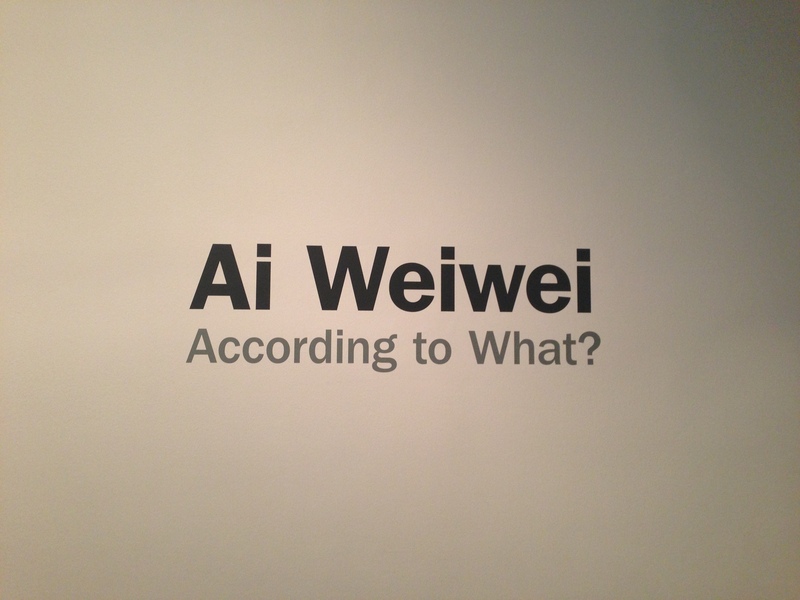 We saw Ai Weiwei: According to What? for the first time not long after its opening at the Hirshhorn. Moved, but left with more questions than answers about the artist and his work, we wanted to wait for a second visit to “weigh in.” With about a month left in its run, if you haven’t taken advantage of the opportunity to view this retrospective of Ai’s work yet (or, perhaps, to see it a second time — something we always recommend with difficult work) you should. Ai Weiwei’s celebrity has loomed large in recent years, and especially since his 2011 detainment by the Chinese government. Further, in light of the world’s close watch on the actions of that country it will likely remain in place. According to What? incorporates Ai’s photography from the 1980s and 90s while he was residing in New York; a number of large sculptural works, mostly from the past 10 years, and many made in reaction to the events of the May 12, 2008 earthquake in Sichuan; photographs detailing the construction of the “Bird’s Nest,” Olympic stadium; and a smattering of other photographic and sculptural projects. No matter the type of work, intense political meanings resonate behind everything in the show. In spite of the undeniable beauty of many of the works, or their clear dialogue with concerns of Post-Minimalist sculpture and Conceptualist practice, one is never allowed to rest on the surface of the works in According to What. The Hirshhorn’s unique, curved building provides a particularly pleasing venue for exploring the works from an aesthetic standpoint and there is a sense of meandering discovery that accompanies the form of the show. Sometimes the politics are more subtle: many of Ai’s works draw on traditions of Chinese craftsmanship, and others use materials like wood from destroyed Qing dynasty temples that gesture to a critique of China’s rapid urbanization and the policies of the Cultural Revolution. Materials are always key: where the wood, or the tea, or the pearls, or the pottery came from, and how they were prepared for display. These charged materials are a reversal of the American Minimalist traditions that Ai demonstrates familiarity with. Whereas sculptors like Donald Judd and Robert Morris used industrial materials because of their perceived neutrality, Ai always chooses materials that are the opposite of neutral, in that they clearly and actively operate within history and cultural discourses. Frequently, the meanings behind his materials need to be unpacked. Straight, which visually is a long, low, undulating assembly of industrial materials, uses 38 tons of rebar taken from sites of the destruction from the Sichuan earthquake. This tragic event killed over 5,000 children (and an estimated 68,712 individuals total) in shoddily constructed schools, while nearby buildings remained intact. Ai commemorates the lives of these children in a number of moving works in the show, including a list of their names, painted on a wall just outside the entrance to the exhibition, and a recording of the recitation of their names. The sound of the names being read, is the first thing that envelops the viewer upon entering the exhibition. This list of names was assembled by Ai himself amidst confusion and a lack of transparency on the part of the government. The cultural specificity of many of the references in the show at times gave us pause, particularly when it came to the work pictured below He Xie (2010 – ). A pile of handmade porcelain crabs is revealed by its wall label to be a multi-layered story about Ai, art, and the government. The title comes from the Chinese word for “river crab.” The word also makes reference to “harmony,” and is used as a slogan by the Communist Party, and a slang term for censorship. The work also commemorates a dinner of river crab that was held by Ai at his studio in Shanghai in anticipation of its destruction by the government. From a purely semiological basis, it felt somehow impossible to fully take in the layers of meaning occurring in this work: 1.) the Chinese word for river crab 2.) its alternative meanings and associations within China 3.) this poignant event in the life of the artist. This is not to say that the effort of presenting the work and educating Americans and others perhaps not familiar with this word, its associations, or these events. They are, however, an unsettling reminder of a cultural and linguistic chasm that exists between America and China; which is perhaps part of the objective of displaying these works in D.C. and New York as a part of According to What‘s global tour. As much as cultivating a sense of cultural understanding might be a part of the show’s goals, reinforcing a notion of alterity seems equally present. Ai Weiwei: According to What? runs through February 24th at the Hirshhorn. The museum is open every day from 10:00 to 5:30.